Posted on February 16, 2015 by Ronald Patrick Raab, C.S.C. This article is based on the Collect (Opening Prayer) for Ash Wednesday. 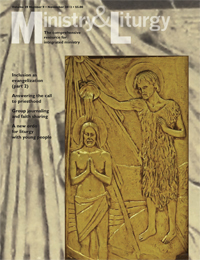 I wrote this for Ministry and Liturgy Magazine in 2012. I hope it will offer you some moments of reflection and prayer as we prepare for the Lenten Season this week. Let me know what you think. Grant, O Lord, that we may begin with holy fasting the campaign of Christian service, so that as we take up battle against spiritual evils, we may be armed with weapons of self-restraint. through our Lord Jesus Christ, your Son, who lives and reigns with you in the unity of the Holy Spirit, one God, for ever and ever. Thank you to Father Ron for this article. It fills me with hope that you are speaking against non-violence and war. Violence only begets violence and retaliation. It is a topic that we as Catholic rarely addressed by the majority of bishops and clergy.